Hello lovelies - long time no blog post! I've taken a lot of time away from this blog to focus on my work and personal life and, in all honesty, I'm not sure if I'll be getting back into posting regularly. 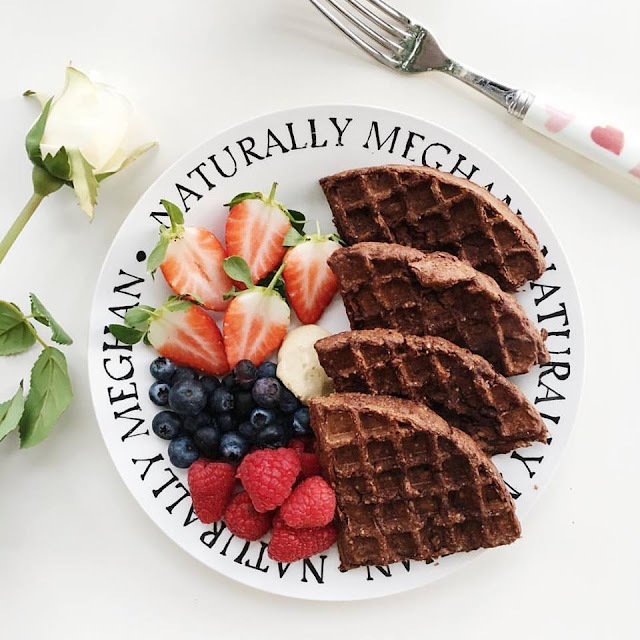 However, I noticed that I haven't shared a recipe for waffles yet which is basically a crime because I've been eating them so often recently! Ever since I got a waffle maker a few months ago they've become a staple in my diet. Luckily I've found a way to make them vegan, gluten-free and refined sugar-free so I can enjoy them safe in the knowledge that they're cruelty-free and they won't hurt my sensitive stomach. It also helps that they taste amazing and are pretty awesome for your body too! I like adding protein powder to mine to keep me going all morning but that's definitely optional. Grease your waffle maker with a small amount of coconut oil (if needed) then preheat it. I have the No-Mess Waffle Maker from Sage and I use setting 2. Once your waffle maker has preheated (mine beeps to tell me it's ready!) pour the mixture into it, close the lid and leave it to cook for a couple of minutes (again, mine beeps). How did you make that plate? Love it!! Also, what camera do you use? Your pictures are always so gorgeous.